In the picture you see the size of our pack roll bags. High waterproof rubber boots with a height of the shafts that should measure at least 30 centimetres. We ourselves use ordinary rubber boots with room for a thick sock and an extra sole. Black, narrow modelled riding boots are not suitable since they are narrow, cold and slippery. Rain coat, not a poncho, and rain pants guaranteed to keep the rain out. Try at home that the rain gear really works and is spacious. The best gear for the riding is a light, somewhat stretchy plastic rain gear with PU-tissue. Don’t use chaps since they don’t work well on the mountain tour but readily sew on loops to your rain pants that will keep the pant legs in place during the ride. Long johns, one or two pairs and perhaps of different thickness. Long sleeve shirt or similar. A cap that fits under the helmet. Mittens or gloves. To avoid wet gloves if it rains a tip is to bring washing gloves to pull on. Scarf or bandana about 70×70 centimetres which among other things might work as a pillow case. Trousers without a rugged seam on the inside of the legs. Good trousers for horseback riding are everyday outdoor trousers, stretch jeans, military trousers or plain ordinary riding breeches. Wind proof shell jacket. Alternatively you use the rain coat with a thick pullover under it. Small towel. Don’t bring a bath towel on the riding tour since it’ll be much too spacious. Warm sleeping bag. We recommend -10 degrees Celsius and then we’ve added a little extra to be on the safe side. If you’re cold some good underwear garment or silk travel sheet are a good complement. For the guests that are only spending the night in our camp at Tjaskal a cooler sleeping bag is on the other hand sufficient. Headlamp or a small torch. Suitable amount of hygiene articles in small packs. Comb, toothbrush, toothpaste, soap and/or shampoo and skin lotion are quite sufficient. 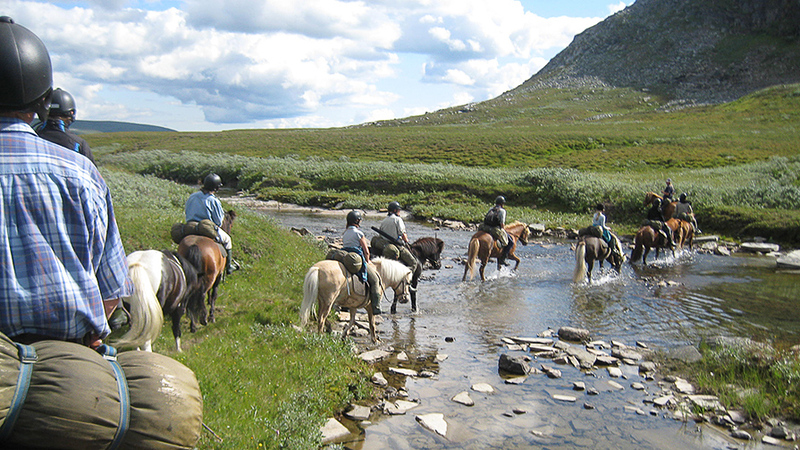 You’ll get a map of the area where we ride on site in Ammarnäs. Those who want to acquire mountain map BD16 which covers all of our tours. A camera is always fun but bear in mind not to bring too much equipment since the horse is carrying it all. A small and neat waist-bag to carry trivia is practical on the riding tours. Candy and nuts are good to bring if the blood sugar starts dropping between the meals. Dark chocolate, sunflower seeds and walnuts are most nutritious but bring whatever you like, that’s the most important. Good and price worthy raingear, trousers and underwear garment etc. can for example be bought from Idefixteko (ITAB) or Engelsons. All your personal equipment (including sleeping bag and rain gear) shall fit in the pack roll bag that you borrow from Fjällhästen. This roll can’t weigh too much but is weighed on site. A weight of six kilogrammes is adequate for the horses to move unimpededly and that there won’t be too much volume behind the saddle. Now don’t be too parsimonious with the equipment so that you don’t bring enough stuff. The things that won’t be brought on the riding tour are left and locked up in Ammarnäs during the tour. 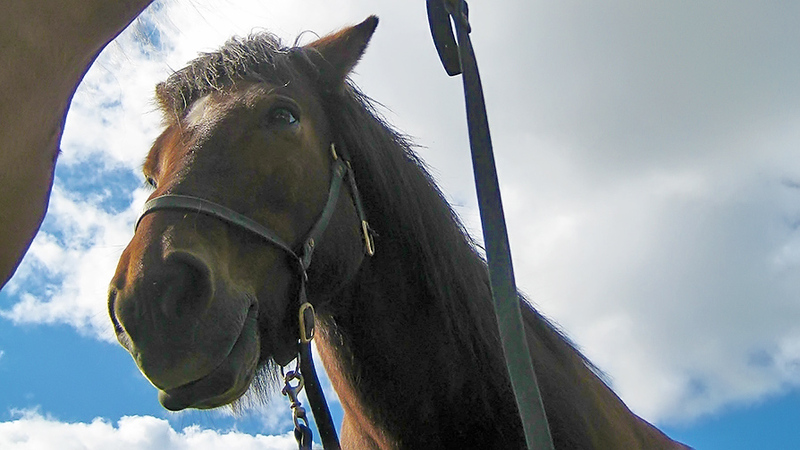 A happy horse is a good companion on the mountain.